Sat Nav may direct you incorrectly on your approach into Lynton & Lynmouth please follow these directions. Follow ROAD signs into Lynton Town Centre, Lee Road. Then at the Town Hall and Memorial and where the shop Costcutter sits turn into Cross Street, Croft House is at the junction at the end of Cross Street on Lydiate Lane. From the M5 Junction 27. Approx. 1 hour 15 minutes, 46 miles. After 23 miles, at Aller Cross Roundabout, take the third exit and join the A399 towards Lynton. After 12 miles turn right at Blackmoor Gate, onto the A39. At Barbrook village, turn left opposite the Petrol garage onto the B3234 to Lynton, fork left after half a mile up Station Hill. On the other side of the hill, follow the road into Lynton town, turning right onto Lee Road. At the Town Hall and Memorial and where the shop Costcutter sits turn right into Cross Street, Croft House is at the junction at the end of Cross Street on Lydiate Lane. Alternatively from Minehead and Porlock follow the A39 to Lynmouth arriving at the bottom of the steep hill, crossing over the River Lyn Bridge bear right onto the B3234 directed to Lynton. Take the very sharp right hand hairpin turn after the steep incline leading you into Lynton on the main road, Lee Road. From the main road turn left opposite the Town Hall and Memorial and where the shop Costcutter sits, into Cross Street, Croft House is at the junction at the end of Cross Street on Lydiate Lane. Parking at any time – You can normally park off street free without restrictions and leave bags safely in the car in Cross Street in front of the Guest House, or adjacent streets, until check in time between 4pm and 8pm, alternatively there is a car park 100 metres from Croft House in Cross Street with no charges between 6pm and 10am. Nearest train station with a bus link is Barnstaple. From Barnstaple Bus 309/310 run throughout the day. 310 timetable , 309 timetable. Nearest Airports are at Bristol and Exeter. Then book a taxi or hire a car. 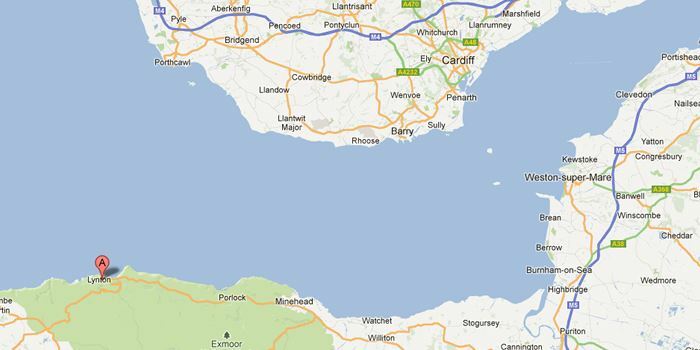 Bristol and Exeter are approximately a 2 hour drive by car.